The Flexistik is a precision made blowpipe designed to achieve the optimum position of the blowpipe and maximum airflow into the pipe bag. It is made of a series of components to adjust the length and angular position of the blowpipe. 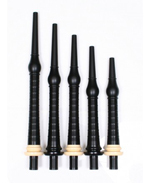 It extends from 8 to 12 inches using a locknut and tube assembly and together with a swivel joint the piper can adjust the blowpipe to position comfortably while performing. Swivel Joint:- Loosen swivel cover and adjust to favoured position, then tighten firmly. The MaxiStick is a precision made blowpipe available in a range of sizes from 8 inches to 12 inches. It has a large bore to allow maximum airflow into the pipe bag and is available with either an imitation ivory or black projecting mount. The mouthpiece is threaded with a 30TPI thread onto the body which accomodates all mouthpieces included in the range of bagpipes from R.G. Hardie and is commonly used by other bagpipe makers. The MaxiStick has an integral valve assembly which will allow the valve to be replaced when necessary. To access the valve unscrew the hemp part below the projection mount. We recommend smearing Vaseline on the valve for a better seal. Mouthpiece Protectors Pack of 2. Run under hot water before stretching over the top of your blowpipe, they will prolong the life of the plastic mouthpiece. We offer 2 sizes with the smaller size fitting a standard mouthpiece and the larger protector fitting the oval mouthpice in the BlowStick range including the MaxiStick, AdjustStick and Flexistick.